Shared Dreams for Independent Living has received our Charitable status! 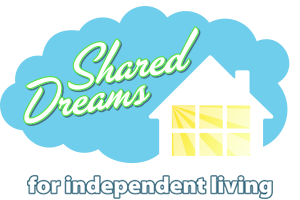 If you would like a receipt for your donation in support of the construction or operation of the Shared Dreams Home please make cheques payable to Shared Dreams for Independent Living. Cheques can be mailed to Shared Dreams for Independent Living at P.O. Box 40043, Charlotte Street PO Peterborough, ON K9J 8R9 to the attention of Larry Elliott. If you are paying by credit card, a receipt will be mailed to you.